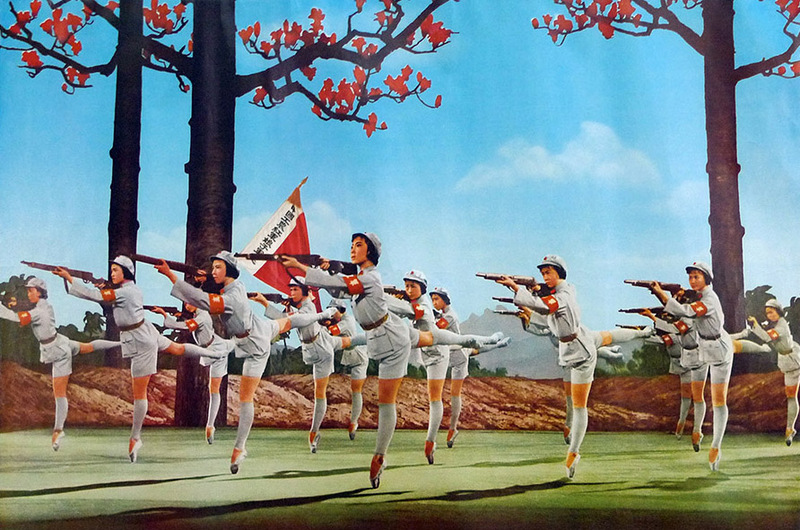 “The Red Detachment of Women” was published as part of Triple Canopy’s Internet As Material project area, which receives support from the Andy Warhol Foundation for the Visual Arts, the Brown Foundation, Inc., of Houston, the Lambent Foundation Fund of Tides Foundation, the New York City Department of Cultural Affairs in partnership with the City Council, and the New York State Council on the Arts. On synchronized female bodies, ethical butchery techniques, and emancipation. A morality tale in three acts. During China’s Cultural Revolution (1966–76), centuries of theater, dance, and opera were deemed counter-revolutionary. By 1969, the government had decided that only eight Yangbanxi, or “model operas,” could be published or performed. These were not operas per se, but morality tales that proliferated in a variety of forms, eschewing the extravagant visual abstraction of Peking opera for peasant clothes and machine guns. The Red Detachment of Women begins in Hainan Island in the 1930s with the protagonist, Wu Qinghua, chained in her landlord’s dungeon as punishment for unpaid rent. She escapes by attacking her guards, but they catch her in the surrounding jungle, beat her, and leave her for dead. Hong Changqing, a Communist Party secretary, discovers the unconscious Wu, revives her with coconut water and coins, and helps her join an all-female Communist military detachment. Together with Hong, they overthrow Nan Ba Tian’s feudal rule—soldiers holding guns leap for joy, daughters reunite with their fathers, slaves toss their chains and raise their fists. In the 1964 ballet version of the model opera, which was filmed in 1970, Wu transforms from a vengeful peasant into a disciplined and idealistic soldier. With the help of party slogans, martial training, and indoctrination sessions, she sublimates her personal resentments and turns learned behavior into automatic reflexes. Her original desire—to kill her landlord—is reduced to a byproduct of the systematized military campaign. The purpose is not to take out just the man, but his whole family, his friends, his friends’ families; all his personal and professional connections, as well as associated institutional structures. This illustrates a key concept of the period: Military triumph produces prosperity, social order, international prominence, and gender equity by totally obliterating the old order. The ballet is remarkable for its synchronization of large numbers of female dancers, which makes visible the country’s efforts toward extraordinary cultural coherence. The ballet also features groups of factory workers moving in unison, the symbolism of which seems more difficult to parse given the social conditions that now characterize China, and the role of American consumers in the country’s industrialization. In one of the ballet’s key sequences, peasants are so grateful for their emancipation that they offer soldiers heaving baskets of food, kneeling in adulation. However, military victories did not actually grant the masses regular access to food; top-down policies stymied agricultural output, and martial regimentation stalled efficiency. The resulting famine was one of the greatest tragedies of the twentieth century. China’s political and economic landscape has changed, but scarcity of resources remains a problem. 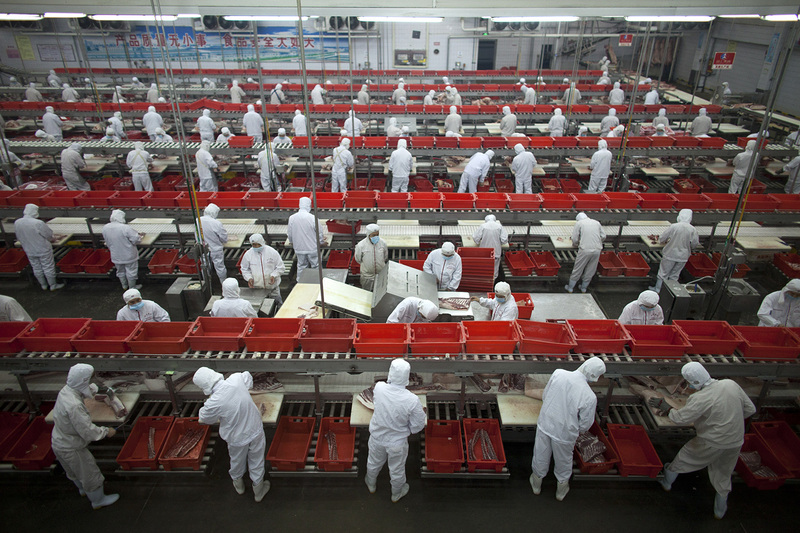 Since 2005, there has been a near-continual pork shortage in China, which is particularly painful because pork is the traditional meat of China. (The visual root of the pictogram of jia, meaning “home” or “family,” is a pig protected by a roof.) Demand rises as the population swells and living standards increase, and because of a peculiar trend: Newly minted members of the middle and upper classes cover their dinner tables with plate after plate of meat; a small fraction is eaten, and the rest is ostentatiously discarded—an aesthetics of affluence composed of heaps of fleshy trash. 1. The dominance of women in other areas of manufacturing—garments, electronics, toys—could be beneficially replicated in the operation of slaughterhouses. The Red Detachment illustrates women’s ability to efficiently butcher, which reinforces the preference of many Chinese factory owners to hire women for their supposed docility, dexterity, and attention to detail. 2. Output can be maximized through improved worker training: standardization of gestures, adoption of new technologies, and education in basic animal psychology. For Wu, retraining was key to personal transformation—which is the beginning of national transformation. 3. Employing advanced tools that are specific to the tasks at hand speeds production, decreases worker injury, and increases output. In The Red Detachment, soldiers are trained in a variety of such tools: swords, daggers, handguns, machine guns, spears, and grenades. 4. These shifts create positive results. For Wu, it is the elimination of her landlord. Today, in China, it is the enhancement of animal welfare. What follows is a manual for industrial pig slaughter, with standards for ethics and cleanliness that promote international ideals. 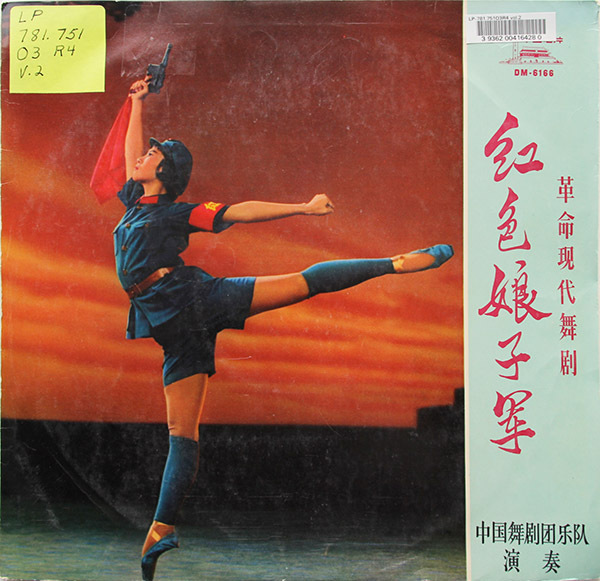 The gestures enacted and outfits worn by dancers, as well as the sounds employed, draw equally from the Cultural Revolution ballet and contemporary food manufacturing, both of which connect the value of a nation to the mechanism of mass female labor. Slaughtering techniques, ordinarily hidden, are made visible and reproducible, and are merged with the ballet’s martial choreography. At the center of the manual is the female soldier-worker. She knows that to work at a factory is to bring glory to the nation. She knows that to dance is no mere aesthetic exercise, but a transmission of mechanized methods of survival. She knows that feudal models of dehumanizing repetition will be forcibly evolved into total synchronization. She knows that supply can meet demand, ethics are perfectly compatible with efficiency, and historical knowledge burnishes the present and future. In the world made by this manual, the coordination of female bodies augurs harmony between militarism and agriculture, war and sustenance. “The Company Commander hands her an apple. ‘Eat. This is your home now. We are all your class sisters.’ Apple! The cool sweet flesh is infused with deep class feeling. For more than ten months she has been a bondmaid. But today, how warm the sunshine, how friendly the people! 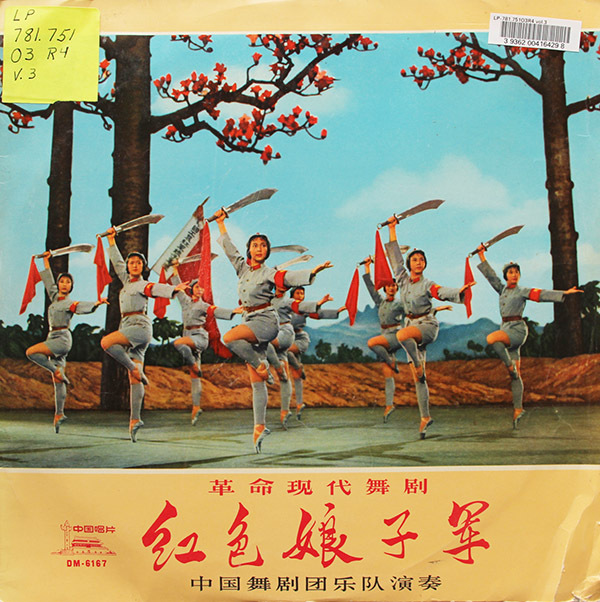 She raises the fruit with both hands and eats.”Adapted from The Red Detachment of Women, a Revolutionary Ballet, collectively revised by the China Ballet Troupe (Foreign Languages Press: Beijing, 1972). “The orchard sends them two four-by-four-by-four-foot boxes per week. ‘It is amazing how much they love the apples,’ Mike told us. ‘You put out two pickup trucks full of apples and think, What have I done? Then, in the morning, the apples are gone.’”Mike Yezzi, Flying Pigs Farm, PASA Conference. “The pigs left yesterday. We had brought buckets of fallen apples, poured them into feed tubs inside the trailer and lured in the pigs. Inside the trailer the pigs were busy eating the apples. I don’t know how long it took them to realize they couldn’t wander back to pasture, that this metal rectangle was now their space. Maybe it hit them as the truck moved forward over the slanted pasture, bouncing through the grass before making the wide turn back onto the road; maybe it wasn’t until they hit the pavement, truck driving 50; or perhaps not even until they arrived at the slaughterhouse and the door opened to a hallway that led them down to their pen, where they’d pig pile for the last time, ending life as it had begun: jumbled and close, snorting and sniffing.”Good Heart Farmstead, “Goodbye Pigs, and Thank You,” September 4, 2013. Video depicting best practices at a pork plant, adapted from Video Tour of a Pork Plant Featuring Temple Grandin, The Glass Walls Project of American Meat Institute, 2012; and Schaller Lebensmitteltechnik with Voran, Schaller Slaughtering Line: Groupwise Lairaging and Back-loader Stunning, 2013. Drop it from the CO2 gondola onto a conveyor belt. Push hook through flesh of back left leg to attach to upper conveyor. Grab left front leg to stabilize the body. Stab upwards at center of neck’s base. Check for any other sign of pig returning to sensibility. Dredge body through scalding tank to soften bristles. Drop in de-hairing machine, which tumbles off bristles with paddles. Discharge naked and hairless body. Burn off any remaining hair and pathogens. Slice through back of neck. Leave head hanging from strip of lip. Snip lip to remove head. Use floating clippers to remove nails. Glide floating saw through upper chest. Cut carefully with knife through groin and belly. Slice downwards and outwards to finish. Cut around bung; seal to avoid leakage. Remove the white offal; pull, guide, and slice. Drop the white offal into inspection tray. Remove the red offal; pull, guide, and slice. Haiping Yan, Chinese Women Writers and the Feminist Imagination, 1905–1948 (New York: Routledge, 2006). Bai Wei, Breaking Out of the Ghost Tower, originally published in Benliu (Currents) 1–4, 1928; translated and published in Yan, 2006. Liu Shaoqi, How to Be a Good Communist, originally delivered as a speech in 1939 (Peking: Foreign Languages Press, 1964). Jeffrey W. Savell, Meats (ANSC 307 Honors) Lectures: Meat Inspection, 2016, Texas A&M AgriLife Meat Science website. Brian Jin, “Industry Leaders Sign Agreement to Create Pig Farm of the Future in China,” Alltech press release, May 21, 2015.